The grave difficulties due to the shortages in essential goods led to popular criticism of political leaders for their failure to lessen the country’s complete dependence on India. After its electoral victory, the Oli government came under tremendous public pressure to enter into an alternate transit treaty with China to end the dependence on India. Having faced two such ‘blockades’ in recent decades, it is indeed difficult for Nepal to contemplate a future recurrence with equanimity. Nepal’s quest for an alternate transit country with a view to reducing its dependence on India succeeded with the finalisation of the text forthe Protocol of Transit Transport Agreement with China on September 7, 2018. As per this text, China formally agreed to provide seven transit points– four sea ports (Tianjin (Xingang), Shenzhen, Lianyungang, Zhanjiang) and three land ports (Lanzhou, Lhasa, Xigatse) – to Nepal for trade with third countries. The protocolmaterialised after prolonged discussions following the signing of the transit transport agreement (TTA) during Prime Minister K P Sharma Oli’s China visit in March 2016. Whether the arrangement willor will not succeed in reducing Nepal’s dependence on India in practical terms is a different matter. But it will certainly give Nepal an edge while negotiating with India on many issues. As per the TTA, China will provide permits to trucks and containers ferrying Nepal-bound cargo to and from Xigatse in Tibet. Nepali traders will be allowed to use any mode of transport— rail or road – to access the sea ports as well as dry ports. Both sides also agreed on accessto Chinese territory from six checkpoints in Nepal. 3The transport arrangements and dry ports could be used for bilateral trade purposesas well. Interestingly, the protocol does not mention anything about Nepal’s overland access to the Central Asian and European markets. Nepal’s negotiations with India for transit rights have had mixed results. The 1978 treaty of trade and transit expired on March 23, 1989 due to differences over political and security issues as well as Nepal’s demand for a separate transit treaty in accordance with the UN charter. As a stop gap measure, India allotted Nepal four out of the 21 until then used trading posts for both transit (Jogbani and Raxaul) and bilateral trade purposes. 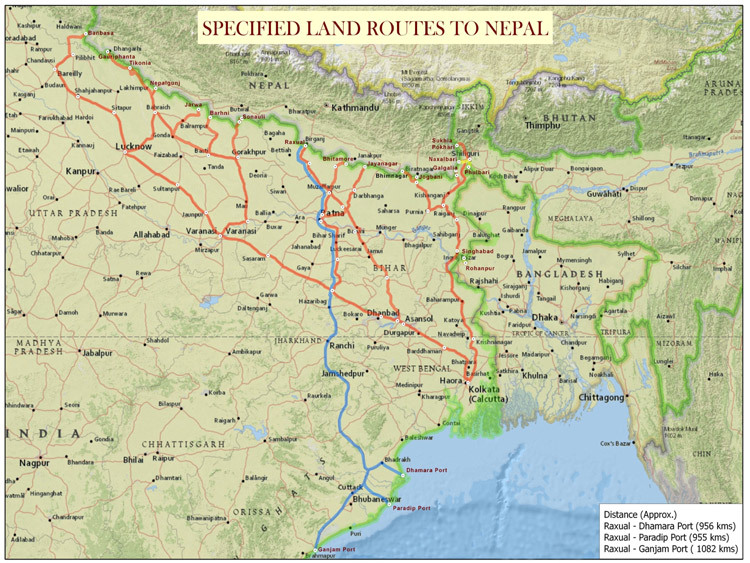 It may be noted that Nepal is entitled to one transit route as per international law. 4This restriction of the number of posts adversely affected, transit trade and consequently the economy. 5In December 1991, the two countries signed two separate transit and trade agreements. But Nepal continued to demand more and better transit facilities in addition to the Kolkata sea port. Accordingly, the treaty was revised in December 2013. 6 Again at the Nepal-India Inter-Governmental Committee (ICG) meeting in Kathmandu in April 2018, the two countries discussed how to improve both bilateral and transit trade. 7 Despite periodic revision and updating of the treatythat accommodated Nepali demands, it has remained a major electoral issue in Nepal and one of the contentious issues in India-Nepal bilateral relations. Despite the signing of TTA in 2016, it took over two years and several rounds of consultative meetings held since November 2017 to finalise the protocol. 8 The final text was delayed for the following reasons: First, there were differences over issues like the number of sea and dry ports to be assigned to Nepal; safeguard measures; security issues; points of entry and exit; interbank market connectivity; modes of transportation; etc. 9 Given their structural incompatibility, both countries had to work hard to finalise the simplification ofthe paper work and information sharing. China had initially proposed allowing transit trade only through the Tianjin port, but Nepal sought additional port facilities owing tothe distance factor. In fact, China was unwilling to offer the facilities that Nepal enjoyed with India. “Nepal proposed to use Tianjin, Shanghai and Guangzhou sea ports, besides two other land ports to facilitate third country trade. ”10 It took more than a year for China to decideon Nepal’s proposal. At the third consultative meeting in Kathmandu held from September 4-6, 2018, China offered Shenzhen and Lianyungang in place of Shanghai and Guangzhou sea ports. In an effort to further satisfy Nepal, China later offeredthe Zhanjiang seaport and Lhasa dry port as additional facilities. The second reason for the delay could be the Nepali demand for extending the Tibetan railway to Kathmandu. China wanted to negotiate both issues separately. It did not find it economically feasible to extend the railway beyond Kyirong (China), without any progress being made on trilateral cooperation with Nepal and India, to make Nepal a transit point for accessing the South Asian market by the land route. Both China and Nepal were aware that without robust land connectivity (railways and highways) and integrated check posts (ICPs), accessing Chinese seaports would prove expensive for Nepali traders. Thirdly, China was also not comfortable with Nepal’s proposal of reopening the Tatopani (located in the Sindhupalchowk district of Nepal) border trade point and establishing a Special Economic Zone there. 11This proposal had both financial and security implications. From the Chinese point of view, the Tatopani trade point had emerged as a major security concern since August 2008, when a large number of Tibetan refugees heldanti-China protests thereas well as in Kathmandu. Chinese security agencies had also observed that Tibetan refugees were using that route for entering Nepal. Besides, China was aware of the US interest in Tibet which was reflected in its proposed investments in Tatopani, where China had already been developing infrastructure. In 2012, the US had wanted to invest in the construction, agriculture, and hydro power sectors in the Tatopani area. 12 Interestingly, the US in the same year had chosen to train 20 Peace Corps volunteers in Sindhupal chowk district, before posting them to Pokhara. Apart from that, a large number of INGOs had been undertaking rehabilitation programmes in the area in post April 2015 earth quake period. Further, as part of its earthquake reconstruction programme, the US proposed to rebuild a new earthquake-safe Barhabise Primary Health Care Centre (PHCC) at Sindhupal chowk. The USD 1.9 million project was constructed by the U.S. Army, Corps of Engineers (USACE). 13 Therefore, China wanted separate assurances from Nepal on this issue, before agreeing to reopen that point for both transit and bilateral trade purposes. Lastly, China wanted to use the transit issue to pressure Nepal into signing the Memorandum of Understanding (MoU) on the BRI with assurances of building all trade related infrastructure projects under that. From the Nepali point of view, the project offers an alternate overland trading route and outreach to the rest of the world. This viewpoint converges with China’s interest in connecting to India by the land route for closer economic cooperation. Nepal and China on May 12, 2017, signed the MoU on the BRI framework agreement. It is to be noted that the negotiations took a dramatic turn in favour of Nepal, with China offering additional facilities to Nepal just immediately after the COMCASA agreement was signed between USA and India on September 6, 2018 and Nepal’s decision not to participate in the India-proposed BIMSTEC member countries’ military exercise in Pune from September 10-16, 2018. It is believed that PM Oli suspected a US role behind MILEX 2018. An analysis of the third country trade route options before Nepal indicates that the northern route both for third country and bilateral trade purposes could prove costlier than the southern route. For example, a 20 feet container takes approximately 45 days (one way) to reach Birgunj, Nepal, via Kolkata, from any Chinese port located on the eastern flank of China. The transportation charges for the entire stretch from any Chinese port located in the south-eastern flank of China to Birgunj vary between USD 1700 and 1900. Nepalese traders pay a high price for transporting goods to Birgunjvia the Kolkata port due to the “current infrastructure and procedural problems.” 14 On the other hand, imported goods from Lanzhou, a western industrial zone of China, take 35 days to reach Kathmandu via Kyirong, Tibet. This distance of around 3,155kms could be covered both by railways and roadways. The four sea ports allotted to Nepal are more than 4000 kms away from Kathmandu (figure-1). Of the four seaports, Lianyungang,at a distance of 3950 kms, could be the nearest seaport for Nepal. As of September 2018, there is no direct railway service from Kyirong to these seaports. Note: Distance calculated in this map is only from Xigatse to four sea ports. In February 2016, India and Nepal signed an agreement allowing Nepal to use the Visakhapatnam (Vizag) port for third country trade, apart from Kolkata. The chief secretary to the government of Nepal, Somlal Subedi, inaugurated this route by sending containers from Visakhapatnam on June 24, 2016. Another advantage of Vizag port is that it is close to Singapore. The Vizag-Singapore distance is just 1,573 nautical miles (NM). Vizag is also well connected with the US, Middle East and European seaports. It offers the services of more than 30 world famous shipping lines, including Maersk and China Ocean Shipping (Group) Company (COSCO). The distance between Vizag and Birgunj is 1,436 kms. CONCOR has assured that it will improve its services by providing more rakes and reducing transportation time to five daysat the earliest. CONCOR’s charges for 20 and 40 feetc ontainers are also affordable (see figure-2). Source: Visakha Container Terminal, Vizag port. Data compiled in June 2017. VZG-Vizag. Rail handling at container terminal (RHCT). Mt-Metric Ton. Other than Birgunj, India recently connected Biratnagar with its railway. The first cargo train from Kolkata Port reached Bathana, Bihar, near the Nepal-India border point at Biratnagar. It took five days for the cargo train to reach Bathana railway station, which is six km south of Jogbani.18 Most importantly, out of the seven proposed ICPs on the Nepal-India border, two ICPs including Biratnagar are already operationalised. The southern transit corridor also offers four more easy access ports for Nepal’s third county trade. The first option could be the Dhamra sea port in Odisha, located between Vizag and Kolkata (refer figure-3). The distance between Dhamra to Biratnagar is around 956 kms. It is one of the deepest sea ports in India with a draft of 18 metres, a 1084 metre berth and an 18 km channel that is sufficient for handling large vessels. The port is connected both by railways and roadways. The Indian Railways, on May 6, 2011, declared that they have a full rake landing point for both inward as well as outward traffic. The second option could be the Chittagong sea port of Bangladesh. This port is well connected by railways and roadways. Nepal could use this port under the BBIN - MVA arrangement (see Figure 4). A business delegation from Nepal on January 22, 2018, visited the port and expressed interest in taking advantage of the empty containers being shipped from the port. Chittagong could prove cheaper than other sea ports for exporting Nepali goods because of easy availability of empty containers. This route will enable Nepal to reactivate its cultural linkages and its economy could get a boost from tourism from Buddhist dominated countries, apart from benefitting from the transit trade. The fourth option could be to negotiate with India for accessing the Kandla sea port of Gujarat, from the Nepalgunj ICP. This route will help Nepal to easily reach out to Pakistan, Afghanistan, the Middle East, Europe and US markets, and encourage economic development in Western Nepal. This route could also becomean energy corridor because Nepal could set up an oil refinery in West Nepal by importing crude oil from the Gulf region. The distance between Nepalgunj and Kandla is 1,500 kms. While the southern corridor offers multiple options for Nepal, there are certain limitations with regard to Nepal’s northern trading routes. 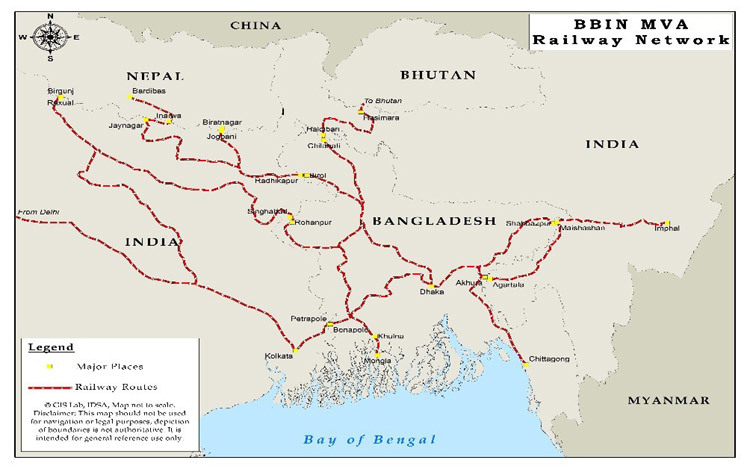 First, although the Lanzhou-Kyirong-Kathmandu (LKM) route takes less time than the Shanghai-Kolkata-Birgunj route, the LKM route gives Nepalese traders access only to the western industrial zones/commercial hubs of China whereas Nepalese traders mostly import goods from China’s south eastern industrial cities. Second, Nepal’s northern trading routes are not viable for carrying bulk goods like raw minerals and oil due to the mountainous terrain. Despite the TTA with China, Nepali traders do not consider the northern corridor as a viable alternative to the southern corridor. Rajen Sharma, the former president of Nepal Freight Forwarder’s Association, observed that “it is not time yet to consider the new route as an alternative transit route. The commercial viability of the project has to be taken into consideration before its implementation”. Former commerce secretary, Purushottam Ojha, also expressed similar concerns. Ojha in fact doubted the commercial viability of the newly-opened trade routes with China. 20Not only in the Himalayan region but even “globally, there is no history of container freight movement [by railways] at such high altitudes due to environmental issues. 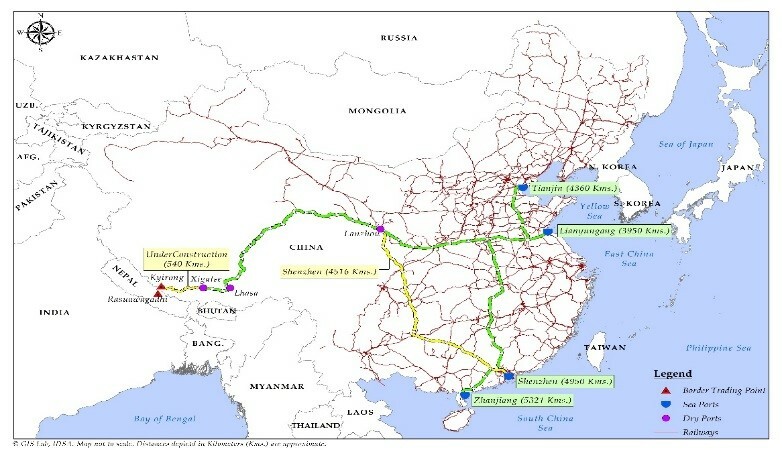 The technical challenges will further determine the carrying capacity of the track and the cost of such transportation.” 21 This also applies to highways passing through high altitude mountain passes, given that China-Nepal trade is based on containerised trade. It would not be in China’s interest to have multiple trading points with Nepal, which could be the reason why it closed down the Tatopani-Khasa trading point immediately after the April 2015 earthquake. However, China will set up small, non-motorable, seasonal local trading points on its border with Nepal, both for gaining the local people’s sympathy and for security purposes. Nepal was a vibrant trading transit route when sea routes playeda limited role in inter-continental trading. In the era of globalisation, sea routes are more cost effective than land routes. This is applicableto bilateral trade between India and China, which reached USD 85 billion in 2018. If Nepal wants to enhance its relevance for India and China, it has to provide a smooth and unhindered trade corridor in the central Himalayan region by constructing modern railways and highways. It is because of the poor surface transportation system that Nepal has failed to export goods. The transit costs and time through those routes should be competitive with those of sea routes. Therefore, if Nepal wants to become a vibrant bridge between India and China then it needs to connect with faster, cheaper and easily accessible routes and facilities offered byIndia and other multilateral arrangements in the region with its industrial and commercial hubs. Instead of always looking for alternatives, Nepal could focus more on the low hanging fruit and continue its negotiations with India and Bangladesh both at the bilateral and multilateral levels. 1. Biratnagar, Birgunj, Bhairahawa, Nepalgunj. 2. “Exports, imports dive due to unofficial trade embargo,” The Kathmandu Post, November 24, 2015.Also see “Impact of Unofficial Indian Embargo on Nepal”, Nepal Rastra Bank, Study Report, November 2015. 3. Rasuwa, Tatopani (Sindhupalchowk), Korala (Mustang), Kimathanka (Sankhuwasabha), Yari (Humla), Olangchung Gola (Taplejung). For details see “Nepal to use Chinese sea, land ports”, The Himalayan Times, Kathmandu, September 7, 2018. 4. Ramjee P. Parajulee, “The Democratic Transition in Nepal”, Rowman & Littlefield Publishers, INC., Lanham, 2000, p.191. 5. See Niranjan Koirala, “Nepal in 1989: A Very Difficult Year”, Asian Survey, Vol. 30, No. 2, pp.140-42. Also see “Impact of Unofficial Indian Embargo on Nepal”, Nepal Rastra Bank, Study Report, November 2015. Also refer “Trade Imbalance with India”, A study conducted by Economic Development and Engineering Research Institute for Nepal Rastra Bank, n.d., p.59. 6. For details, see Minutes of the meeting of Nepal-India Inter-Governmental Committee (IGC) on Trade, Transit and Cooperation to Control Unauthorized Trade held In Kathmandu on December 21-22, 2013. 7. For details, see Meeting of Nepal-India Inter-Governmental Committee (IGC) on Trade, Transit and Cooperation to Control Unauthorized Trade held at Kathmandu on 26-27 April 2018. 8. The protocol is a subsidiary agreement which contains details about the procedures of transit. 9. “Nepal-China transit treaty negotiations end”, The Kathmandu Post, March 19, 2016. 10. “ Officials uncertain about Transit and Transportation Protocol signing with China”, The Kathmandu Post, June 16, 2018. 11. “Third meeting on transit and transportation next week,” The Kathmandu Post, August 30, 2018. 13. Press release: U.S. Government unveils plans for Bahrabise health center reconstruction, USAID, April 18, 2016. 14. Devirupa Mitra, “China’s Freight Train to Nepal Is No Threat, But Indian Border Infrastructure Needs Fast Upgrade”, The Wire, May 18, 2016. 15. For details, see Ch. R. S Sarma, “Box shipment from Vizag to Nepal flagged off”, The Hindu BusinessLine, June 24, 2016. 16. Traffic Department, Visakhapatnam Port Trust, July 2016. 17. “Third-country cargo arrives at Birgunj directly via Vizag”, The Himalayan Times, September 11, 2018. 18. “1st cargo train arrives near Biratnagar”, The Kathmandu Post, April 30, 2018. 19. “Bimstec to launch ambitious land, air, sea transport plan”, The Hindustan Times, New Delhi, September 17, 2018. 20. For details see “Traders: Access to China’s ports not a magic bullet” The Kathmandu Post, September 9, 2018. 21. Pratim Ranjan Bose, “China’s inexplicable Nepal rail project”, The Hindu BusinessLine, June 22, 2016. 22. For details, see “Food supplies for Dolpa remain stuck at Rasuwagadhi for a month”, my Republica, Kathmandu, September 13, 2018. 23. “Road from Kolkata to Kunming?” The Times of India, November 27, 2012.